In fall 2012, undergraduate students in the McCormick School’s “Introduction to Tribology” course received a challenging assignment: Select a surface in nature and write a paper about its properties’ engineering applications. Michelle Lee (mechanical engineering ’13) took those words to heart — and, for the next eight months, focused on compiling, writing and editing more than a dozen papers for publication. 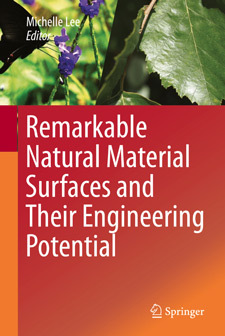 Her hard work paid off: This month, the 13-chapter book, Remarkable Natural Material Surfaces and Their Engineering Potential, was published by Springer Science+Business Media. While Lee took the lead on the project, four other students from her class — Mindie Chu ’13, Shiqi Luohong ’12, Ignacio Estrada ’14, and Yunho Yang ’13 — also submitted chapters. Estrada’s chapter, “Botanical Leaves: Groovy Terrain,” explored the hydrophobic properties of rice leaves — that is, the leaves’ ability to repel rainwater and debris as a result of its surface’s angles. Similarly, one of Lee’s chapters, “Shark Skin: Taking a Bite out of Bacteria,” investigates the antibacterial properties of shark skin, which can be used in hospital settings to prevent the spread of infection. “Like this, a lot of engineering applications are very practical,” Lee noted. For her part, Professor Wang wrote the book’s foreword, collected photos for several chapters, solicited feedback from her colleagues, and shepherded Lee through the book proposal process. Lee says that the book was written with a lay audience in mind. She wants more people — not just those with technical expertise or engineering backgrounds — to understand nature’s power and potential to change the way we live.